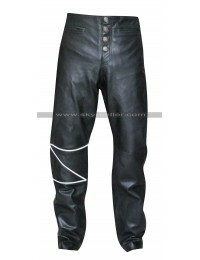 River Road Pueblo Cool Leather Pants for Unisex as the name suggests is a pant which features the finishing of leather and is stitched with intricate delicacy. The pant has been considered as a perfect choice for it being suitable for both the genders. It has been made out of black color and the slim fit layout of this pant makes it appear much attractive. There are buttons throughout the edges of the pants. The ends of the pant also feature a line of silver buttons enhancing its appearance.